Actinium is a silvery, radioactive, metallic element. Due to its intense radioactivity, actinium glows in the dark with a pale blue light. Actinium is found only in traces in uranium ores as 227Ac, an ? and ? emitter with a half-life of 21.773 years. One ton of uranium ore contains about a tenth of a gram of actinium. 235U (or 239Pu) is the parent isotope of the actinium series decay chain which ends with the stable isotope 207Pb. 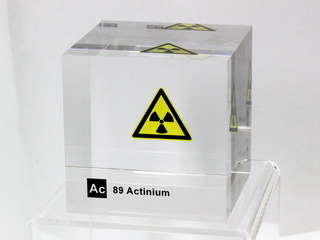 Actinium is found in trace amounts in uranium ore, but more commonly is made in milligram amounts by the neutron irradiation of 226Ra in a nuclear reactor. Actinium metal has been prepared by the reduction of actinium fluoride with lithium vapor at about 1100 to 1300ºC.